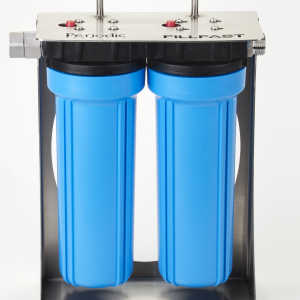 This duo contains one Patented Chelok Filter and a sediment filter for use with FillFast Marine. Treats up to 5,000 gallons depending on water quality. Dockside uses include pre-filtering water for fresh water tank fills, water makers, water softeners, and RO systems. FillFast Marine Replacement Filters contain one Patented Chelok® Filter and one Sediment Filter for use with FillFast Marine. The secrect behind FillFast Marine is that it uses a Chelok Filter, which is patented by Periodic Products. The Chelok Technology is patented in almost 50 countries world wide. FillFast Marine is designed to pre-filter dockside water to remove high levels of metals before they foul your water softener, RO membrane, or water maker. Each FillFast Marine includes a stainless steel stand and fittings, a leader hose, and a venturi to help in the process of metal elimination. Keep your vessel and surfaces stain free with FillFast Marine.